We have about one hundred board books in my youngest son's room. This collection has grown over the past five years along with our two other children. A large majority of the collection was acquired when my now three year old son was a toddler. He loved his board books. I remember worrying at one point that he would never read anything other than his special collection. 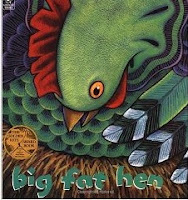 He definitely had his favorites and one was Big Fat Hen by Keith Baker. The colors in this book are bright and bold. The "One two buckle my shoe" rhyme is easy to listen to and read. Baker adds on to the rhyme with the Big Fat Hen's friends laying lots of eggs which hatch with a burst of yellow on the last page. This week we read two other books by Keith Baker that were based on nursery rhymes. The first was Potato Joe which is Baker's version of "One Potato, Two Potato". Not only will you meet Potato Joe but also Tomato Flo and Watermelon Moe! The second book was Hickory Dickory Dock . The mouse goes up the clock and many other animals visit with each passing hour. The mouse interacts with these animals from atop the clock until midnight. Then he parachutes down from his perch and heads off to bed. 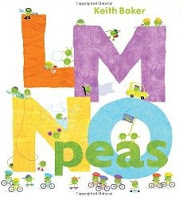 Sticking with the vegetable theme but diverting away from the nursery rhymes is Keith Baker's very popular ABC book LMNO Peas. I found an interview conducted by Readeo, a website that allows you to read books together over the internet, on their blog Readeo BookChatter. Baker described the origin of the book and answered many questions about the process of making the book. 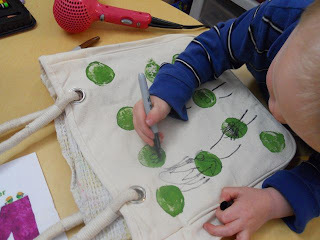 I was surprised to learn that he illustrated the peas "electronically". I guess it was wise to use the computer when you have hundreds of peas riding bikes, climbing, and doing all sorts of other fun activities. 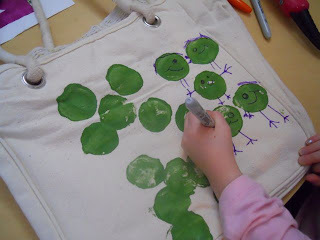 In contrast, when I first read the book I thought it would be fun to make "pea"-ple with green paint and a brand-new eraser on the end of a pencil. But later, I worried my youngest would have a hard time giving the small green spots faces, arms and legs. I abandoned the eraser idea and decided to instead use a potato stamp. This craft idea took yet another turn with all the thoughts of peas and potatoes floating around in my mind. 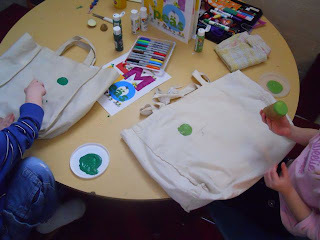 It was then I thought the "pea"-ple would look great on the side of a canvas bag used for shopping at the local farmer's markets we attend during the summertime. I found two lightly colored bags from our current stash that would to work just fine. 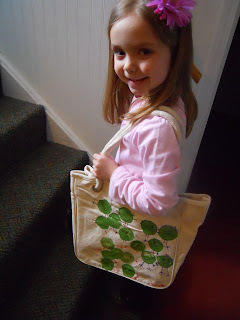 Then, my daughter had the idea to make one for her Grandma's birthday, so I purchased an additional bag for under $10 at the local craft store. We made sure that the two potatoes we cut for stamps were not "Potato Joe"! They each stamped a side of the third bag that was going to be the special birthday gift for Grandma. My son said, "I made peas with a potato!" 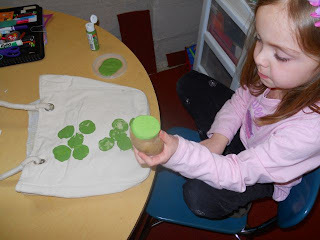 We used a Sharpie to turn the peas - "pea"ple. 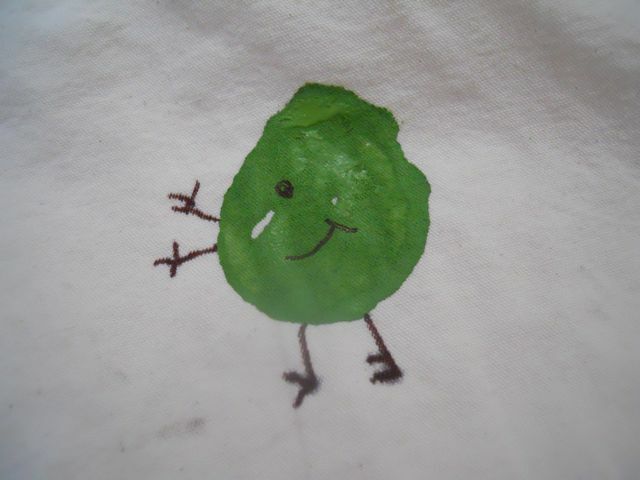 My daughter used different color Sharpies to make her peas! The first pea made by my daughter. So cute! Ready to go to the Farmer's Market! I don't think I've ever read anything by this author. I'mm gonna have to check him out. Love the art you did with your kids and love your daughter's pea people. So cute! Seriously, those bags are so stinkin' cute!!!! I love it! It's crazy that I just posted a review of LMNO Peas today! I need to get better at looking at the author's other books, their birthdays, and websites and stuff like that. You are awesome. I would never have thought to make our own peas. My kiddo may be a little too young to draw the faces on...but maybe not. Great project!!!! 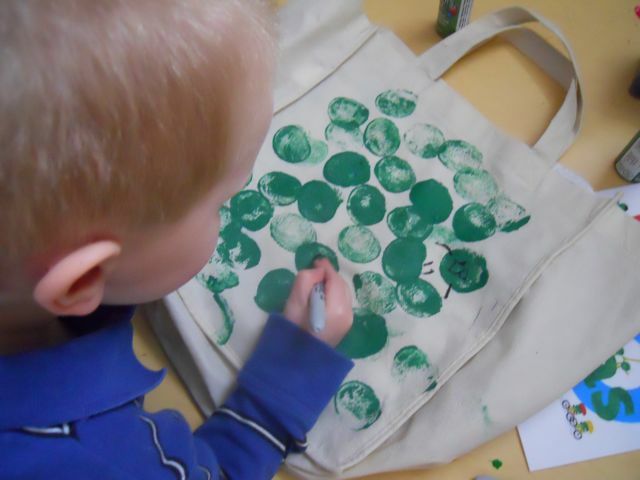 It looks like you had a great time stamping with potatoes! I'll have to try that with my kids.